Granted, everywhere you turn in Paris is a scene from a romantic Hollywood movie: The ancient buildings, the history, the vibe and that stylish casual look of the Parisians. 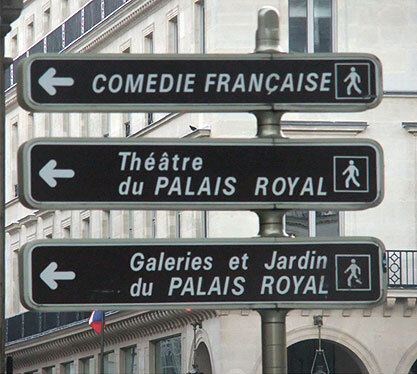 Paris is indeed the city of love and it holds many little hidden treasures and finds off the beaten tourist track. One such find is the cafe Le Villalys located in the Palais Royal. 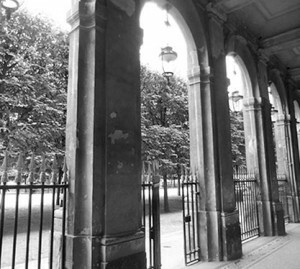 The Palais Royal was once home to prestigious royals and it still boasts a beautiful manicured garden accessible to the public. The ground level of the building is tenanted with shops of all kinds and includes cafes and restaurants. Le Villalys offers its patrons a choice of either indoor or outdoor seating with a relaxed and casual atmosphere amongst the grandeur. I was surprised to find an extensive double-paged tea list with descriptions of each tea. 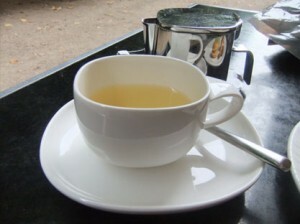 The waitress was quite familiar with the tea menu and she provided great whilst assistance fielding my questions well. I selected the Malesherbes tea and the Rooibush Zoulou blend. I came to try the Malesherbes blend through the insistence of the waitress. I am glad I followed her advice as it was an unusual yet beautiful perfumed tea. This tea is concocted by the established French tea masters Betjeman & Barton (1919). A wonderful Sencha green tea, it was flavoured with passion fruit, peach, strawberries and rose petals and was the colour of green tea with a yellow tinge. 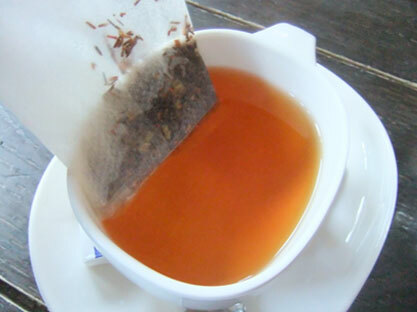 Even though the tea was served in a metal tea pot and a tea bag, the specially designed tea bag was large enough to allow the large tea leaves to move freely and to steep. This extraordinary well thought and well balanced tea still excelled despite being served in a tea bag, with a lovely lingering aftertaste of passionfruit. The scent was equally appetising. The Rooibush Zoulou blend (also by Betjeman & Barton) too was a delight. Here Rooibos leaves (Rooibos is, in fact, a shrub and not an actual tea although often referred to as one) are blended with cinnamon, cardamon, cloves and vanilla. Sunflower petals add flecks of yellow to complete this nutty yet subtly spiced melange. It, too, was served in a large tea bag which allowed the leaves to move and infuse. Both blends were so delicious I couldn’t help but imagine just how much better and enhanced their taste would have been properly brewed with loose leaf tea leaves. Nonetheless, excellent tasting blends in a more clandestine location of Paris with all of her beauty and grandeur.